Also Called: Rhombic evening primrose. Stems: Erect, simple or branched, hairy. Leaves: Alternate, simple; rosette blades narrowly oblanceolate, 1.2 to 3.2 inches long, 1/12 to 3/4 inch wide, margins wavy-toothed to nearly pinnatifid, petioles often as long as blade; stem leaves oblong-lanceolate to lance-ovate, 3/4 to 3.2 inches long, often crowded, margins nearly entire to remotely toothed, surface hairy, petioles short or absent. Inflorescences: Spike, 4 to 12 inches long, dense, terminal. Flowers: Floral tube slender, .8 to 1.6 inches long, short hairy; sepals 4, lanceolate, 2/5 to 4/5 inch long, sparsely hairy; petals 4, yellow, 1/2 to 1 inch long, rhombic-ovate; stamens 8, shorter than petals; style as long or longer than petals; stigma 4-lobed. Fruits: Capsule, cylindric, often curved, tapering toward tip, 2/4 to 4/5 inch long, short hairy; seeds in 2 rows in each compartment, reddish-brown. Habitat: Stream valleys, roadsides, and waste areas; sandy soils. Distribution: Throughout Kansas, but principally in central three fifths. 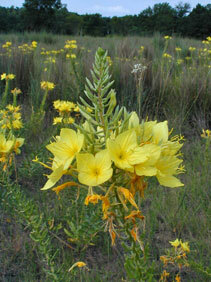 Forage Value: Deer will eat fourpoint evening primrose. Comments: The showy flowers open around sunset and close during the morning. The flowers are pollinated by night-flying moths.